A bad week for medical research in Italy – but science is fighting back! The approval on Wednesday by the Italian Chamber of Deputies of the amendments to directive 2010/63/EU – referred to as Article 13 – was a very sad day for science in Italy (and there have been far to many of these lately). While some of the provisions in Article 13 are quite innocuous, even rather pointless as they just restate what the directive already says in a slightly different form of words , several of the amendments have the potential to do enormous and lasting damage to biomedical research in Italy. 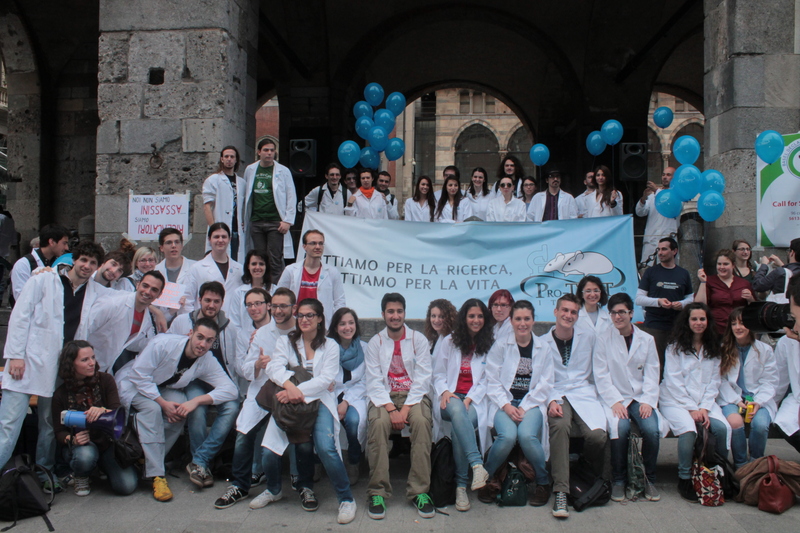 Italian scientists must continue to fight for the future of medical research! consistent with the commitments already made to the legislation in force, in regular training and refresher courses for operators of establishments approved and take all measures deemed appropriate in order to encourage research in this area with the obligation for the competent authority to communicate through the bank of national data, the transposition of the methods and substitutions. 2. In the application of the principles and criteria referred to in paragraph 1, the Government is obliged to respect the obligations arising from legislation or national pharmacopoeias, European or international. As a recent article on this blog explained, parts (d) (f) and (g) are a serious threat to biomedical research and the welfare of laboratory animals in Italy, though other parts – notably (b) and (e) – are so poorly defined that they may also cause problems. These are the amendments approved by the Italian Senate earlier in July and then by the Chamber of Deputies on Wednesday. For example, the amendment dealing with xenotransplantation alone has the potential to hamper many areas of medical research – and even medical practice – as it does not define what is meant by “xenotransplantation”. It may block vital cancer research that involves xenografts or tumorgrafts, the use of porcine heart valves in cardiac surgery (a common procedure that has saved many thousands of lives) as well as research to improve those valves, block bioengineering/tissue engineering research which involves transplanting tissues from one species in another, and even stop significant numbers of stem cell research projects where stem cells from one species are transplanted into another . These amendments must not be enforced, if they are they will do terrible damage to science in Italy. It’s a bad situation, and one more example of how the far too many Italian politicians are out of touch with science. Fortunately there is some hope. The law transposing the EU directive into Italian law was rushed through the Chamber of Deputies by the Italian government because Italy was facing large financial penalties due to being late in transposing and implementing the Directive, so the government did a deal with the Deputies so that the text approved earlier by the Senate was approved without further amendment (any amendments would have been sent back to the Senate for approval again causing more delays). In doing this the Parliament agreed to delegate to the government the drafting of the specific laws and regulations implementating of the Directive. So now the ball is in the government’s court: it will have to write the legislative decrees, and the Government will have to do so in a manner consistent with the provisions of paragraph 2 of Article 13, which states that “In the application of the principles and criteria referred to in paragraph 1, the Government is obliged to respect the obligations arising from legislation or national pharmacopoeias, European or international”. Article 2 of Directive 2010/63/EU specifically bars countries from imposing additional stricter national restrictions on animal research unless they were in force before 9 November 2010, which of course means that the most worrisome amendments in Article 13 are actually in breach of Directive 2010/63/EU. As an article posted earlier today on the Pro-Test Italia website (in Italian) points out the Italian government, and specifically health Minister Beatrice Lorenzin, has accepted the advice of the parliamentary commission and several orders-of-the-day made by deputies who do realise the importance of animal research on Wednesday that some of the amendments in article 13 are highly problematic both legally and scientifically. The Government now has the opportunity to introduce safeguards that ensure that these amendments do not harm Italian science (and lead to the EU starting infringement procedures against Italy), and to prepare new amendments to correct the problems at the next reading in the Italian parliament. In short there is still everything to play for, and it has become apparent that the voices of science are beginning to be heard by an increasing number of Italian politicians. The mobilization of the scientific community in Italy on this issue in the past few weeks has been unprecedented, and our friends in Pro-Test Italia have played a leading role in encouraging and coordinating that response. Now is the time for the Italian scientific community – and their colleagues throughout Europe and beyond – to redouble their efforts and make sure that these amendments are consigned to the dustbin of history where they belong. It seems that the message about the threat posed by the amendments contained in Article 13 is getting through to the wider Italian medical research community, as well as the message that these amendments can and must be stopped. La Repubblica reported on Tuesday that the largest Italian medical research charities, including the AIRC (cancer research), Telethon Institute (research into genetic disorders) and AISM (multiple sclerosis), are taking a stand in support of crucial animal research, and that more than 3,000 scientists have written to the Italian Government to argue against the proposed new laws that threaten to devastate medical research in Italy. The article also quotes an Ipsos poll earlier this year which showed that a majority of Italians support the use of animals in medical research. It’s great to see that Pro-Test Italia is now being joined by Italy’s leading medical research organizations in the fight for the future of science, as they begin to turn the tide and persuade increasing numbers of politicians and the Italian government to support – not block – vital medical research. Posted on August 2, 2013 September 22, 2014 by EditorPosted in Animal Rights News, News, Science NewsTagged animal research, animal testing, Directive 2010/63/EU, Italy, Pro-Test Italia, transposition. Next Next post: Advancing Medicine through Experiments on Animals: Room for Improvement?